So I’ve been a little stalled lately and haven’t been posting very much. The summer was slipping away from me so quickly—and so so very hotly—that I simply couldn’t muster the strength to bake or cook in my nine-hundred-degree kitchen. But now it’s starting to feel like fall in New York and I’m getting nostalgic for all kinds of “back to school” books from my past and wanting to bake a million varieties of appley cinnamony confections. For some reason the fall always makes me want to re-read Anne of Green Gables. Maybe it’s because of all the beautiful autumnal colors in the PBS adaptation of the novels, or the number of days I played hooky from school to watch it, but I think most likely it’s the plethora of comfort foods cooked and eaten throughout the book. Lucy Maud Montgomery novels are so full-to-the-brim with cooking and eating scenes they could fill an entire cookbook on their own. In Jane of Lantern Hill there’s Mrs. Meade’s butter cookies, Jane’s Irish stew and Mrs. Snowbeam’s rice pudding, in Pat of Silverbush there’s iced melon balls, lemon coconut cake and pea soup, but my favorite of L.M. Montgomery’s food scenes comes from Anne of Green Gables. Oh, it’s so hard to choose between this one and the mouse in the plum cake scene! But for now we’ll focus on this one–plum cake with Marilla’s pudding sauce some other time. Halfway through the novel, Anne invites her new “bosom” friend, Diana, over for an elegant tea party. 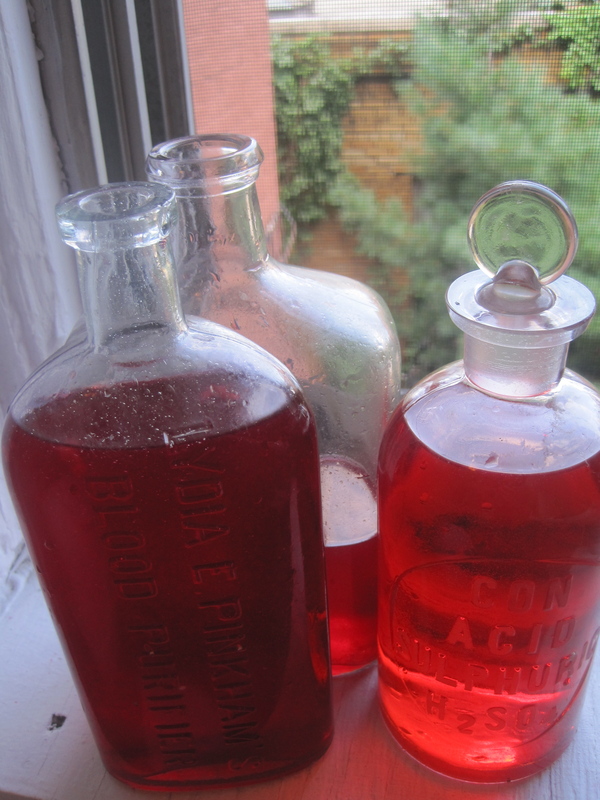 She’s excited to feed her fruitcakes and cherry preserves but mostly she’s excited that Marilla said they could drink some of her famous (non-alcoholic) raspberry cordial. “Marilla is a very generous woman. She said we could have fruit-cake and cherry preserves for tea. But it isn’t good manners to tell your company what you are going to give them to eat, so I won’t tell you what she said we could have to drink. Only it begins with an r and a c and it’s a bright red colour. I love bright red drinks, don’t you? They taste twice as good as any other colour” (172). Anne has never tasted cordial before so she has no idea when she pours Diana a generous glassful that she is actually giving her currant wine. Diana, feeling “awful sick” from all the alcohol, stumbles home to her prim and proper mother who blames Anne for Diana’s drunken state and forbids Diana to ever see Anne again. 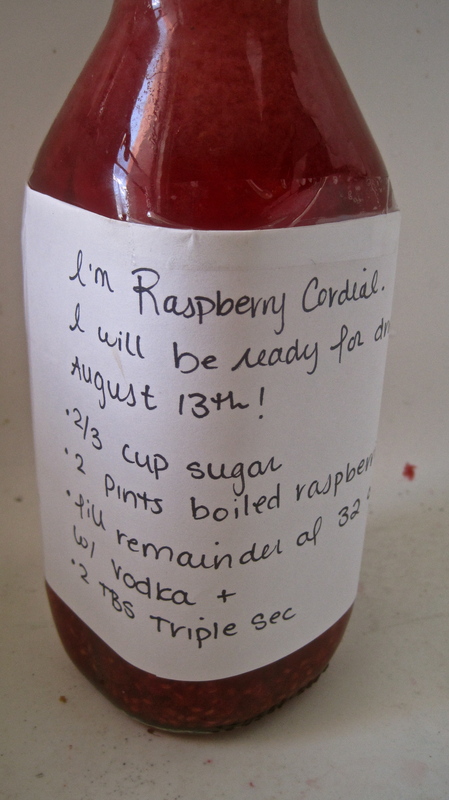 While Marilla’s cordial in the book isn’t alcoholic the recipe given here certainly is. It’s a perfect recipe to make now before good summer raspberries disappear into winter. 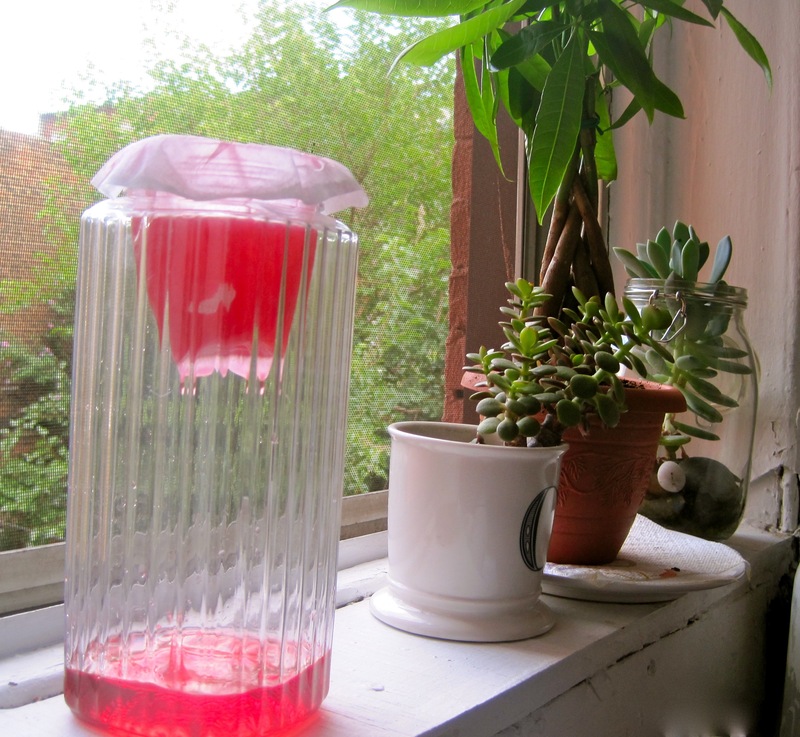 And since the cordial has to soak for a minimum of two weeks, by the time you do drink it you’ll be neck-deep in chunky sweaters and needing a reminder of summer. 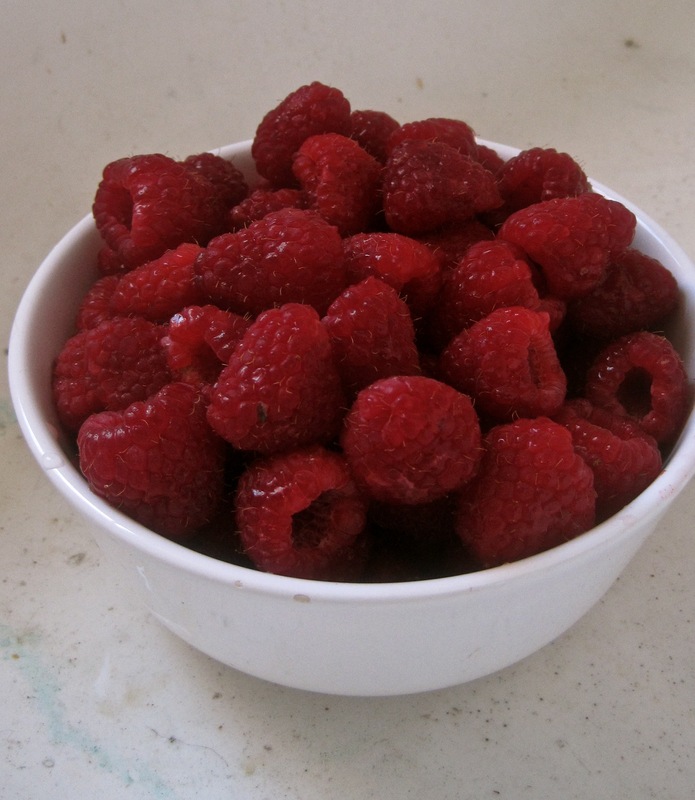 Boil raspberries and sugar in a sauce pan until soft, smushing berries with the back of a spoon. 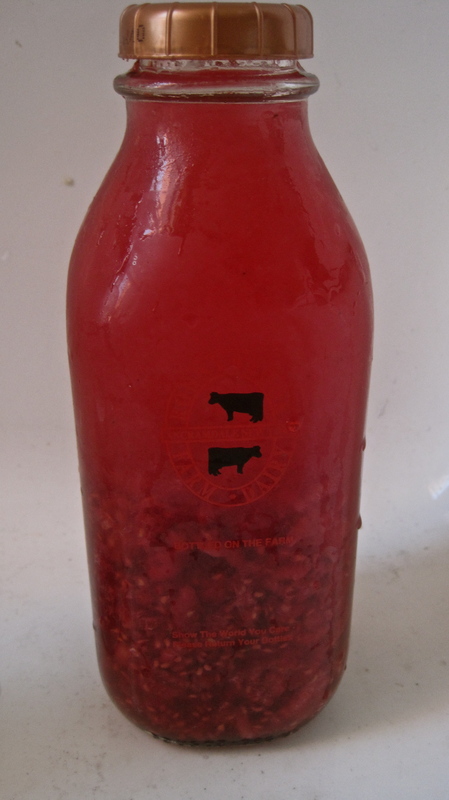 Let berry sugar mixture cool and funnel it into a 32 oz. container. Add 2 tbs triple sec and fill remainder of the bottle with vodka. Shake and let sit for a minimum of 2 weeks. 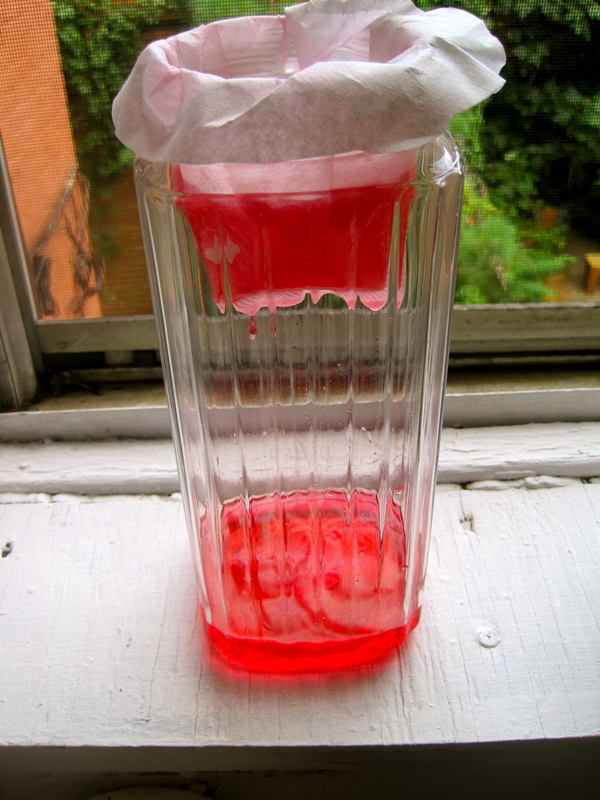 After at least 2 weeks strain using a fine mesh sieve or a coffee filter. Be sure to squeeze berry mush thoroughly to get all of the good stuff out. Enjoy!